Joana wears Virgin wool poncho by M Missoni, Cotton controlled fringe skirt by Maria Korovilas, and Sandals by Intentionally __________. .
Joshua wears cashmere poncho and handkerchief by The Elder Statesman, cotton crew neck top by Olderbrother, cotton pants by Namche Bazaar, and boots stylist’s own. Phil wears Organic cotton parka and Striped organic cotton raglan top by Nudie Jeans, Jumpsuit by Bliss and Mischief, Boots stylist’s own, and Wool knit cap by Olderbrother. Sera wears Wool coat by Olderbrother, Robe and pants by Bliss and Mischief, Turtleneck by Objects Without Meaning, and Red leather clogs by The Palatines. Julianna wears Jacket by Objects Without Meaning, Jacquard dress by M Missoni, and ‘Hutton’ wool hat by KIN/K. 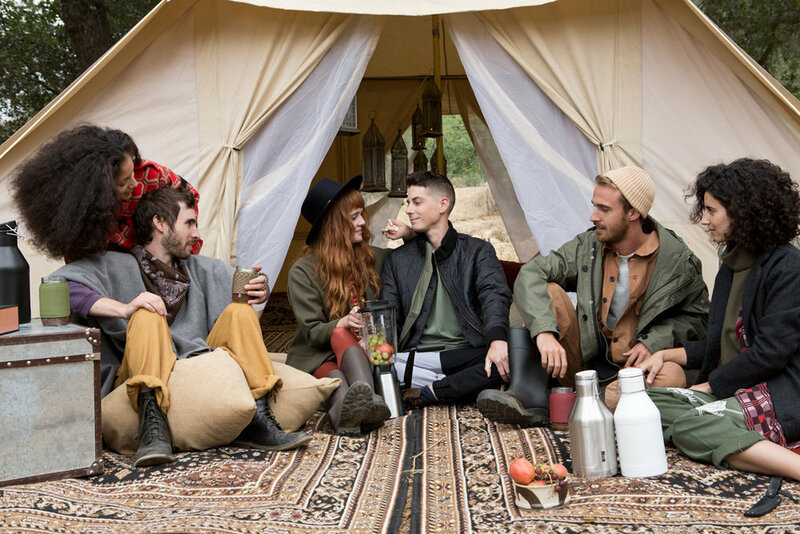 ‘Nomad Luxe’ Tent by Hábitas, 64oz Vacuum Insulated Growlers by MiiR, Switch Portable Bluetooth speaker, conference device, and portable charger by Native Union, Hand powered Outdoors Vortex Blender by GSI, and Compadre Camp Axe by Buck Knives. Alex wears Quilted parka liner and Organic cotton T-shirt by Nudie Jeans, Reversible Jacquard cotton and wool jacket and knit pants by Wrk-Shp, Socks by Darner, and Boots model’s own. ‘Nomad Luxe’ Tent by Hábitas, 64oz vacuum insulated growlers by MiiR, Switch Portable Bluetooth speaker, conference device, and portable charger by Native Union, hand-tied paracord and mason jar drinkware by Khordz, hand powered outdoors blender by GSI, and Compadre camp knife by Buck Knives. Alex wears Quilted parka liner and Organic cotton T-shirt by Nudie Jeans, Reversible Jacquard cotton and wool jacket and knit pants by Wrk-Shp, Socks by Darner, Boots model’s own, and Wool knit cap by Olderbrother. In Three Parts, Far From Here. They were her friends; myself only agreeing to go in hopes of solidify my status as merrily lane unlimited—a sort of reforestation of my belief that well rooted individuals are reflections of the company they keep. She looked good in green and I was good at working over a room so I gave in, packing up old Coleman and traveling down the path of commitment. What I would find were introductions to the new getaway mentality—movement without escape, beauty without the beast, safari without the sweat. I guess being single wasn’t so bad, right? A Zehnte Babelsberg’s-worth of curated detail: sprawling Moroccan tents with floors padded by plush rugs and scattered throw pillow opulence with antler or alyssum or agate touches where the brush opened to a narrow clearing. They were the communal chariots of instantaneous expectance sinking a weekend away in the soft touches of light sepia and easy cable television banter. My thoughts of Edward Abbey quickly eclipsed by the overwhelming presence of Abbot Kinney. And the girls smile and whisper between hair covered curves upon shoulders and boys put ringed hands to shoulders and squeeze: they were kids from the photographs of Shaughnessy growing up busy with success. I go tent-to-tent, I go to talk-the-talk, walking in with teeth, looking for a connective force that I would take back to her, proving a dedication to the prospects of union. Her hat falls on the plush carpets and toes on loan from the Korean spa stop to inchworm out canvas flaps while her hair in crimson covers the floor, covering the tarmac, covering the sunburnt riparian brush crushed by Macintosh heat. They rest pale fingers in the doves of their soft lined pockets—bows and giggle, while he’s straight faced like crystal stone on chain. She’s making beet greens smoothies—she’s leaning on arms not pigmented for rich tangelo and persimmon shades of a sun: they had dream catchers like kinetic mobiles over a hope chest. He’s into pomades (he’ll show me by the hot shower) but not tattoos: powder coated, curved heritage walnut, condor plumage, and moccasin epaulettes. He is swimming through banded onyx snaps and hexagon bangles made by Ojai yeomen into merit badges for the atelier’s alter. His jawline is a natural insecticide. She is a strawberry moon unto herself, listening to “Calico Skies,” before cabin fever creeps in: they make love like kale and mango without tarnishing their impersonations of bottle-feed deer in the middle of a low bandwidth Wi-Fi highway. There was no more afraid of the dark with them. “We need no make-ups when in recreational spirits,” or so she tells me despite my clear confusion. Busy holding hands, busy narrating thumbs—toes between Bedrocks: he drinks a matcha latte, hand cranking a gourmet blend while a red dress disappears into Pillow Mountain. She is a side-sleeper. The ever-deepening restlessness of her locks claim big tents or petite vintage. Reishi buttons on the draped poncho, on the jute shawl, on the sauntering duster. Multiple outfit changes are at the ready. They offered apothecary remedies for snakebite or carpal tunnel: elixirs despite past issues, cedar smudge calling us Indians, and macramé wrapped blown glass clatter on duffle suitcases dropped by new-Burmese bellhops via Uber. I would have fully expected Mycology placards. She clearly doesn’t like asparagus but nettle tea gets her in the mood; ordering Tocos powder via PayPal while he slips into Father Yod pajamas. Synthetic wishbone breaks perfectly down the middle for these two. After selfies with the pieces—tasseography and they discuss how glorious the trees over the next hill must be despite not getting around to visit. She gets a great signal here: full bars, harmonica overalls, burning sage over the surge-protector. “Welcome to the earth,” he says although I had been there for a while now, sitting on a new pyramid of cushions they had stacked for Transmission Meditation. The length of their segmented limbs, gazelles in fine cloth as they joked about the collection of firewood. Galleries, where he does the brochures in Aracne Condensed, could do no better. And sure, they’ll like archery now too. Together they covered everything with the roomy sweet-talk of grape-eaters, tongues laced with Fernet-Branca—they adorn the entrance with candled lanterns and tins of Hart’s pennyroyal. Between two elms, the scenery of Audrey Grendahl Kuhn or O’Keefe without the bare skull, they neck between text messages. They were dancing to “Computer Blue.” His eyes the color of the same and she’s a raven Cinderella in backcountry crampons climbing the seduction of unnecessary accessories and the hinted scratch of a light beard’s lay-away commitment to the cause. Their olives and khakis call out the deep corners of the pitch: fresh linens for the day off-set the tacky-sheen of leather, large bowls of farmer’s market fruit as an offering for wild horses. They feed each Norwegian lox with Flinders rose bud and raw goat cheese without the proper paraphernalia for feeding although he did lay Hudson wool around their necks like Catskill bibs. Astral Guides are discussed over tasting plates: gold inlay in wood. During his spare time he designs cell towers that look like ponderosa: GPS in wildland. “Do you belong to the Santo Daime,” she asks but was already onto answering an incoming email before I could put a palm to my skull to salute. And it was easy to slip away with the varying distractions; I took to a rough bedroll in the bone-dry creek bed trying to reconnect to a more physical imagination. I picture her in a tent of her own (∆ “Geodesic Do Me”), with a surrogate me, tending to her portfolio, trending on the topic of “lifestyle,” pretending that we were the star-children Gemini. And I am overcome by the fear of becoming consumed by a quiet “happiness” that coincided with the delicate tracks of humming electro-eccentricity: something vacant in the tranquility, too busy by data of the now to know how to be in it. It was just easier making friends when we were younger, before we knew too much, before the possibilities of a lover’s entourage could distract us from inherent needs of reality. And now the original cougar, Mother Nature, dressed up with Yellow Bush Penstemon and White Evening Primrose, has sold me on an affair as shelter from all this endless deposable information. She drags me from the twelve knees scintilla plagioclase feldspar, pulling me with her breeze and branches and bewilderment, being “one traveler” despite having to leave behind the comfort of young bodies plugging into tomorrow. Photographer: Magdalena Wosinska for webberrepresents.com. Stylist: Sissy Sainte-Marie for TheRexAgency.com. Models: Alex, Joana, Joshua, Julianna, Phil, and Sera. Hair: Stefani Padilla at Stefani-Padilla.com. Makeup: Elie Maalouf for JedRoot.com. Production Assistants: Ray Manuel Omaña Gonzales, Maryana di Prisco, and Madeline Saxton-Beer. Tent and furnishings provided by Hábitas at OurHabitas.com. Special Thanks: Kfir Levy, Eduardo Castillo, and Joana Ayala.